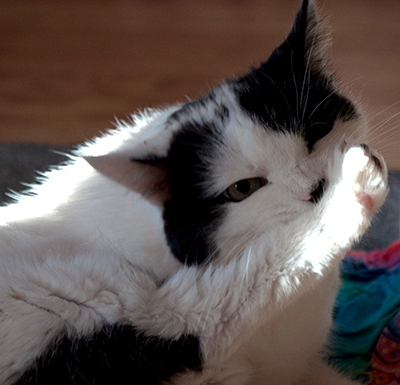 Pet Blog: How Did My Indoor Cat or Dog Get Fleas? There's usually one good answer to this puzzling question - you or one of your human family members! So how and why did you bring fleas into the house? You didn't roll around on the grass with Rocky and all the neighbors' hounds - right? Did you take an afternoon nap under the trees with the Jones' orange tabby last week? I didn't think so! Fleas tend to jump onto your pants legs and other body areas (smelling or sensing your warm blood - their food) when you walk across grass, brush by bushes, common public areas, even just a door mat where other animals have been. If you live in an apartment building or townhouse the concentration of pets in your area make it even hard to control fleas. People walk their dogs by your entrance or common walkways numerous times per day. if you use an elevator, it increases the likelihood by thousands of times per day since your neighbors probably walk their dogs via the elevator, and you and your pets are a very captive audience. Okay, so what if you live in a pet-free complex and you still get fleas somehow? Wildlife outside like squirrels, rabbits, opossums carry them and more than likely people walk their dogs by your property every day. Stray animals can wander everywhere. Contrary to what most people think, flea seasons last all year round in most climates throughout the United States. Flea populations obviously increase substantially during the warmer seven wet months of spring and summer. Why is this such a problem that you should be so concerned about it? Fleas can transmit parasites, worms and dangerous diseases to animals, pets and even to humans. Dogs can suffer internal parasites, tularemia, flea allergy dermatitis, and haemobartonellosis. Cats can get tapeworms (which are contracted when they eat fleas), feline infectious anemia, and Bartonella, also known as cat scratch disease. Fleas are associated with or contribute to feline asthma, rodent ulcers (also called eosinophilic granuloma complex), psychogenic alopecia (baldness caused by over-grooming), autoimmune disease, miliary dermatitis (skin rashes), hot spots, ear infections and possibly inflammatory bowel disease and acral lick dermatitis. For humans, fleas pose severe itching and skin infections, typhus and even the plague in certain parts of the world in the recent past. As the itching and irritation increases, some pets and people can develop an allergic reaction to the saliva of the flea, in extreme cases, this can cause anemia. Major infestations can be life-threatening. Flea bite irritation can bring on behavior disorders, serious side effects like fighting, biting, etc. As professional animal communicators this is where we come in to help your pets deal with behavioral aspects of flea issues. We can also help you as a pet parent understand and better diagnose repetitive fur licking, hot spots, over grooming issues if they continue once you have treated for fleas. In an upcoming post we will deal with treating and the prevention of fleas. See how we can help your pet family with all types of behavior, health, and other issues with animal communication and Reiki for animals.